All of these trucks are great alternatives to a \"#1 Dad\" tie. Is buying a certified Infiniti better than a new car? This is the best-preserved C5 Z06 currently listed for sale on Autotrader. Starting today AutoTrader.com is offering a free iPhone app that allows users to carry handy car shopping tools in their purse or pocket. 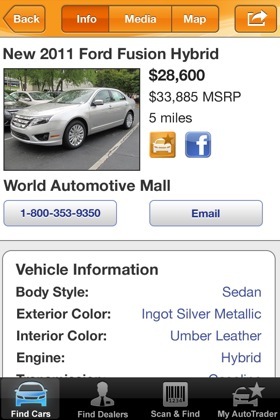 The AutoTrader.com iPhone app can help car shoppers even when they're not sitting in front of a computer – like when they're out visiting dealerships. With the iPhone app, shoppers can find cars and dealers near them, use location-based features and access everything they need to find the perfect car. "AutoTrader.com has nearly three million listings on our site, making it the number one place shoppers turn to when they're searching for a car online," said AutoTrader.com President and CEO, Chip Perry. "With this new iPhone app, we are taking the AutoTrader.com mobile experience to the next level, creating a seamless PC-to-pocket experience where shoppers can take their searches on the road without sacrificing functionality." As Perry noted, "The AutoTrader.com mobile site attracts over a million unique visitors each month, with nearly 40% of those users accessing the site from an iPhone. By introducing the AutoTrader.com iPhone app, we are able to create a more personalized and robust experience for the largest segment of our mobile audience." 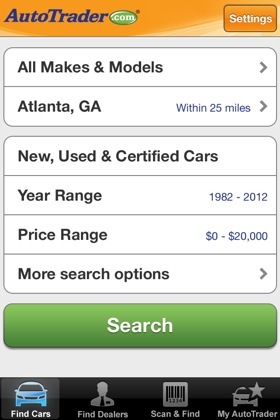 AutoTrader.com's iPhone app also allows users to access saved cars and searches from their MyAutoTrader profiles. You can even use it to scan a car's VIN barcode to start searching for similar vehicles. For Facebook users, the app has a sharing feature that allows shoppers to post vehicle listings to their Facebook profiles and get instant feedback from friends and family. Find Your Car: Shoppers can use the iPhone's built-in GPS to search for new, used and certified vehicles nearby based on preferences like make, model, year, price, color, and body style. From the results, users can view details for a particular vehicle, email or call the seller, see more information about the dealer (including more inventory), see photos and get directions to the car using an interactive map feature. Shoppers can also save vehicles to their MyAutoTrader profiles, so they can easily get back to their favorites later. 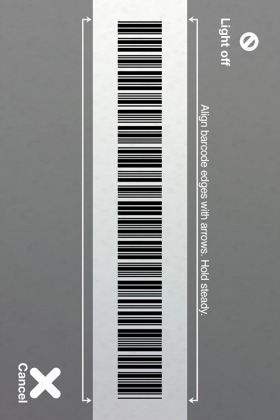 VIN Scanner: Shoppers can use the iPhone's camera to scan a vehicle's VIN barcode to launch a search for similar cars. If the vehicle being scanned is listed for sale on AutoTrader.com, the user can see its details and save it to their MyAutoTrader profile. Find Your Dealer: Shoppers can search for dealers that meet their needs. 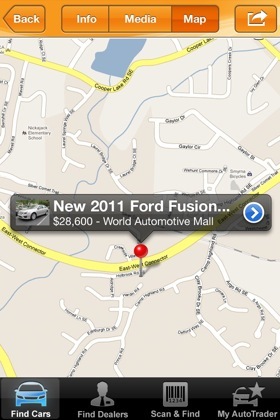 For instance, shoppers can use the iPhone's GPS to locate a dealer nearby that carries a specific brand. Users can also enter keywords to refine their search. MyAutoTrader: Shoppers can save individual vehicles to their MyAutoTrader profiles for quick and easy access. They can also save searches to run again later without having to re-enter the selections. Information saved to MyAutoTrader can be accessed from any Internet accessible device – including computers, the AutoTrader.com mobile site or the AutoTrader.com iPhone app. 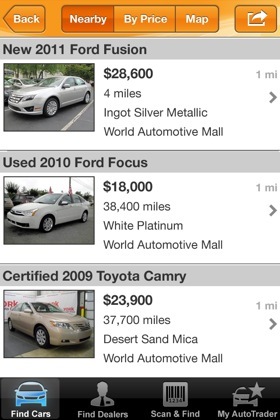 The AutoTrader.com iPhone app can be downloaded for free from the App Store starting today. Click here to access the page directly.